Consider this post to be part local destination travel blog, part yarn and needles review, ALL happy! I've been preparing for my upcoming trip to TN by crocheting like a madwoman! I haven't done any knitting in a long time...til today. Today, I pulled out some stashed yarn and cast on a blanket with my new, customized square knitting needles from Kollage. Click on the photo to make it bigger, and you'll notice they're engraved with my nickname: b.e.e. I got these on a monthly subscription basis through a local yarn shop in Harmony, Pennsylvania: Darn Yarn Needles & Thread. I highly recommend this shop! The owner, Lisa, has a beautiful and welcoming space where you can shop, or sit and visit, or even sometimes watch a movie with her while working on your projects. The products she offers are really great! Her speciality is American-made and locally-sourced yarn and supplies, as well as items that are eco-friendly and fair trade for those things that can't be found domestically. She has spinning and weaving supplies in addition to the traditional knit and crochet items, and also offers a variety of classes. And a trip to Harmony (if you're coming from the city like I do) is worth it because Harmony has other cool things to offer, such as the Harmony Inn for lunch or dinner, or Wunderbar for coffee and food, or Two Fraus Bakery for some delicious, sweet treats! There are antiques, gifts, and book shops, an art gallery, and a museum, too! Through Darn Yarn, I signed up for a needle-of-the-month subscription service. Every month for a year, I received a new set of brightly colored, custom-engraved square knitting needles. They came in a variety of sizes, and will be perfect for many projects to come. I chose the soft cables, though they also offer firm, and both have their place depending on what you like. I placed my order for the engraving, and magically they arrived every month! Casting on the first project with my new needles is making me INORDINATELY happy! The needles have a good feel. They're easy to hold, and make a satisfying "click" as you work with them. I like the soft cable because it's easy to move it through the stitches, and there is no coiling of the cord in the yarn (something that will drive me crazy when I'm trying to knit). I've tried the "firm" cable in the past, and it also doesn't coil much. Some people may find the soft cable a little too soft, so it really depends on personal preference. But I like no fight in my cable. As to the yarn, it is SO soft and luscious. 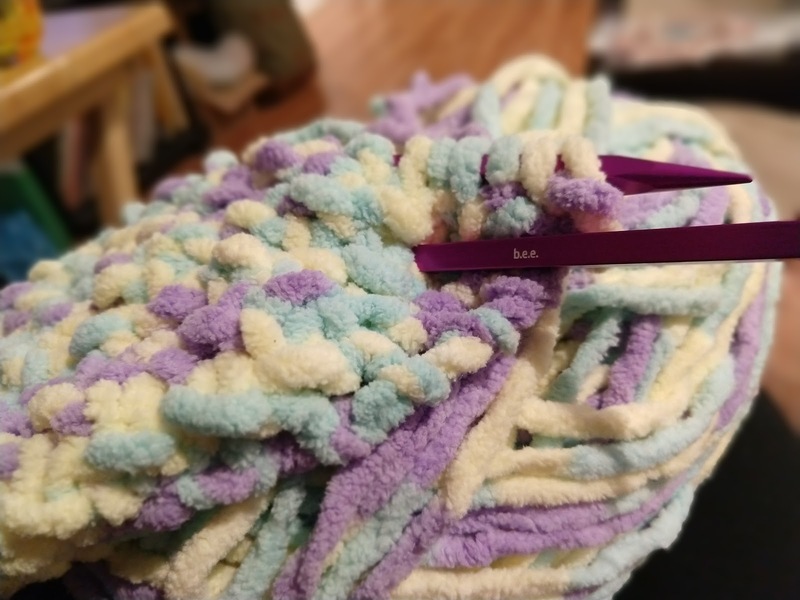 It's Bernat Baby Blanket super bulky yarn. It's really fun to work with and I am sure I'll get more someday to do another blanket. Muscle memory has kicked in, and I'm having a lot of fun knitting again. It's been a great way to relax on this holiday. Today is Presidents' Day in the U.S., and my husband and I are kicking back and doing absolutely nothing pressing today. It has been SO peaceful! So, that's today's happy thing. I will be writing about this in my gratitude journal tonight. Please write and tell me: what is making YOU happy today? Share below or on one of my social media links! Keep going with your adventures and keep inspiring!